Home > Car Care > When does a car battery need to be replaced? The main function of a car battery is to start your car. 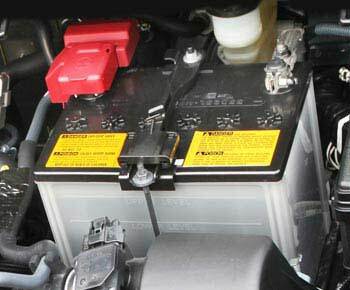 Today, most cars have a single maintenance-free 12-volt acid battery (in the photo). A car battery is rechargeable. It uses its charge to power the vehicle systems while it's parked and to turn over the engine when you want to start it. Once you start the car, the alternator generates additional electric power to recharge the battery. Read more about recharging below. On average, a car battery lasts from 5 to 7 years. The battery lasts longer if the vehicle is driven daily and the battery is kept fully charged. When the vehicle is parked for extended periods of time, the battery deteriorates sooner. We have seen the battery lasts up to 10 years. Several car owners commented on our FB page that their battery lasted for over 11 years. Testing the battery capacity with a battery tester. costs from $20 to $50. 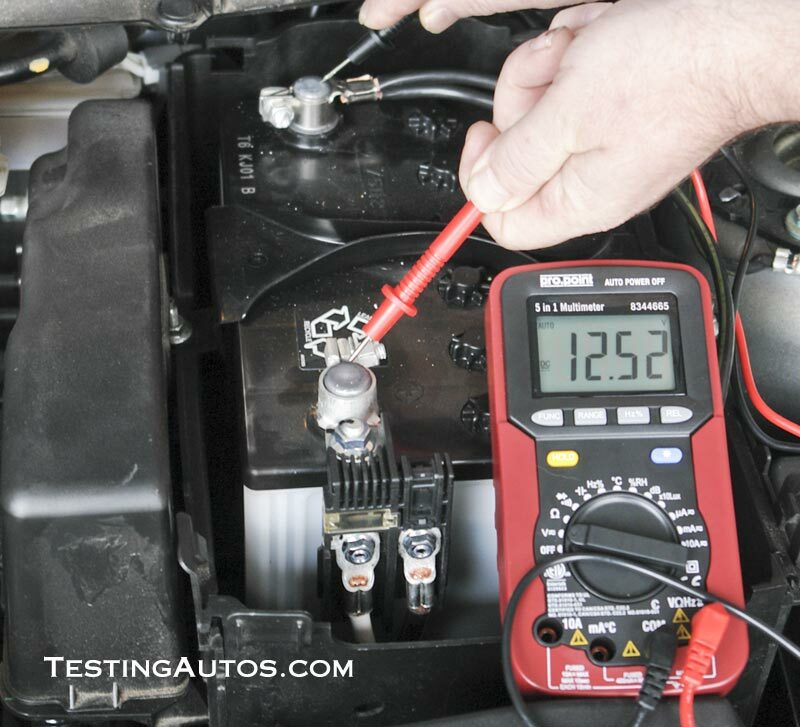 Some auto parts stores such as Autozone or O'Reilly Auto Parts offer a battery test at no charge. 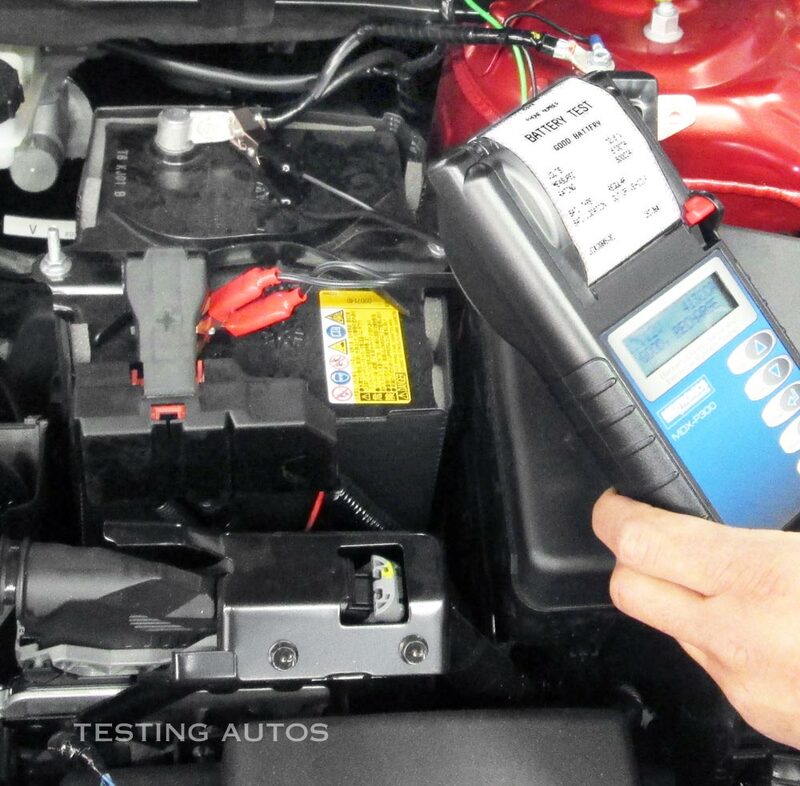 Many car dealers and repair shops often offer a free battery test as a part of a seasonal promotion. After the test, you might get a printout, showing the battery CCA rating and the measured CCA. The printout will indicate if the battery should be replaced or just need to be recharged. See the sample printout in the photo. Can you test a battery with a voltmeter? The battery voltage is a good indicator of the state of charge of the battery. A fully charged battery should read 12.6 Volt or more with the engine off. Testing the capacity of the battery with a voltmeter is more difficult. One way is to test the voltage of the battery under load, for example, with the headlights on. Testing the battery state of charge with a voltmeter. If the battery voltage with the engine off and headlights on drops from 12.6 Volt to less than 11 Volt in a couple of minutes, the battery is weak. Can a problem with battery terminals cause the vehicle not to start? Yes. If one of the battery terminals is loose or corroded, it may cause many problems including a no-start, check engine light, stalling, as well as lack of the electric power steering assist. Many dealers and reputable repair shops visually inspect the battery terminals during regular oil changes. Your mechanic may recommend servicing battery terminals if they are corroded as in the photo. The battery terminal service costs from $25 to $50. 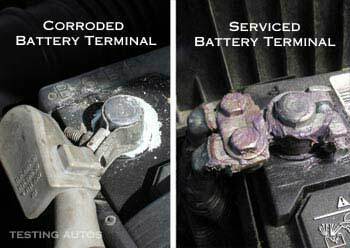 Corroded vs. serviced battery terminal. It includes cleaning the battery posts and terminals and applying a protective spray or grease. How much does the battery replacement cost? 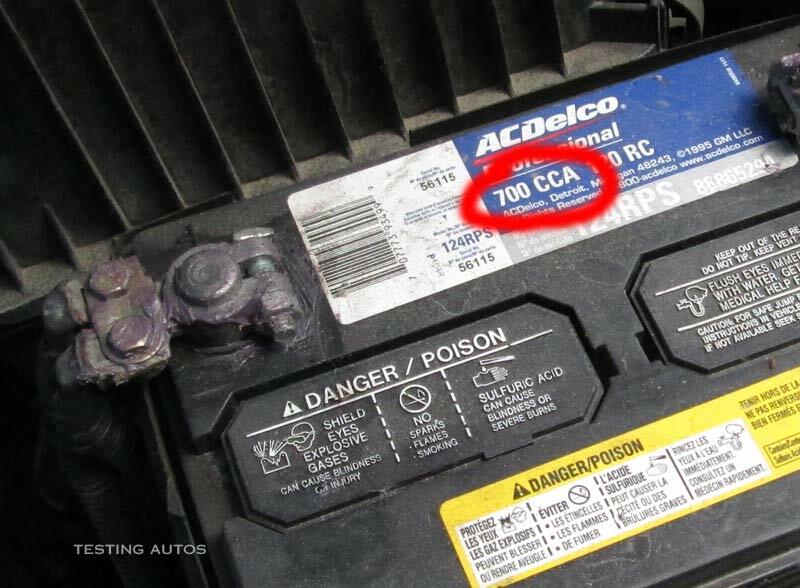 A new car battery costs from $60 to $180 and your dealer may charge another $30-$50 to have it replaced. Replacing a car battery as a do-it-yourself project is not very difficult, but the battery is heavy (30-45 lb). Lifting it out of the car can be hard on your back. An old battery is often covered in the electrolyte, which is very acidic and can burn your clothes or skin. 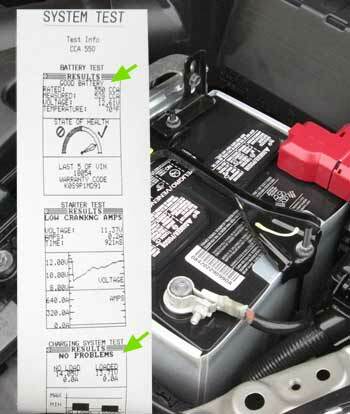 Here is the DIY battery replacement guide from Pep Boys. Our recommendation is to leave it to the pros. Where to recycle an old car battery? Some automotive repair shops and car dealers will accept your old battery for recycling. You can find the nearest place to recycle your old battery at the Interstate Batteries website. 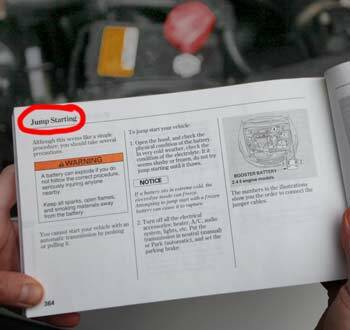 Find instruction on how to jump-start your car in the owner's manual. the part might be covered 100 percent within the first year, 50 percent within the second year and so on. You can find the warranty coverage details in your Warranty Guide brochure, or on the manufacturer's website. How to boost a car when the battery is low on charge? To boost a car, you will need a portable booster or jumper cables to boost from another car. 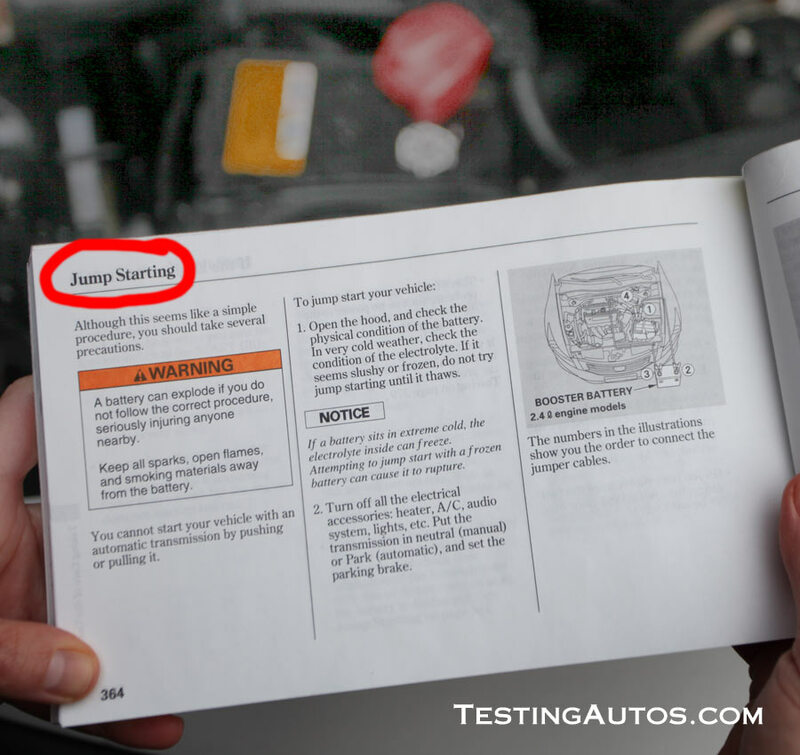 Your owner's manual has the proper instructions. Be careful, if the booster cables are connected to wrong terminals, it may cause a big spark and some fuses and other electrical components could be fried. How long does it take to recharge a good battery that is low on charge? If the battery is still good, 20-40 minutes of running the engine or driving is usually enough to recharge it. However, be aware that in some cars with electric power steering, the steering assist might not work properly until the battery is sufficiently charged. That can make driving with a low battery dangerous. If a good battery has not been used for an extended period of time and is completely drained, it might need longer time to recharge. In some high-mileage cars, the engine may run rough at idle or even stall after replacing the battery. This happens because when the battery is disconnected, all learned settings in the engine computer, including the idle speed are reset. For this reason, some older cars may require the idle speed re-learn after the battery is replaced. The procedure varies for different cars, but it won't take you long to google it. To avoid this problem, many repair shops use a simple memory saving device that keeps the engine computer powered during battery replacement. In modern cars, the idle speed is re-learned as you drive.